Hylton: Why would I leave Luton? Leading scorer Danny Hylton has reassured Hatters fans he won’t be leaving the club over the summer. The 23-goal hitman, who netted his 50th goal for the club in just 89 appearances at the weekend had been linked with a move away from Kenilworth Road during the last transfer window. However, he confirmed that he will be lining up for Luton in their return to League One next season, saying: “Unless Real Madrid or Barcelona or somebody gives me a massive amount of money, no I won’t be leaving. “I love it here, it’s fantastic. 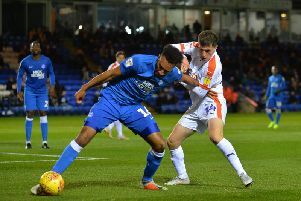 Hylton was thrilled to be able to send near enough 10,000 Luton fans home happy on Saturday as two late goals from Olly Lee and Pelly-Ruddock Mpanzu saw Luton triumph 3-1. When we got two and three, I was delighted for them, because they could cheer and love it and it was a great day for them. He added: “They’re wicked every week and we said that before the game. “No disrespect, we probably could have had six or seven in the first half, the keeper’s made some worldie saves, point blank saves. “We gave them something, the last home game of the season and edging closer and closer, 1-1, the game’s sort of dying out a little bit. “When we got two and three, I was delighted for them, because they could cheer and love it and it was a great day for them.